I looked at myself in the mirror. I am not sure if I am shocked or saddened... or even relieved. For the last six or more years, I have avoided mirrors. 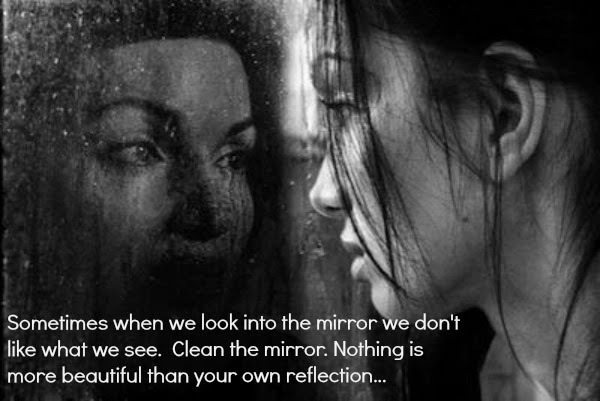 It's not really a vanity thing, at least not when I dig deeper into the reasons I avoid mirrors but more psychological. Don't get me wrong, there are SOME reasons that are related to vanity but not 100%. For some reason on Tuesday, I looked long and hard at myself in the mirror. I mean, I REALLY looked. I looked beyond the obvious. I looked past my cratered skin that is in desperate need of moisturizing. Beyond the eyebrows that are begging for a wax. Beyond the fine lines that have started appearing despite my hiding from the sun. I looked deep into my own eyes. Have you ever truly studied your own eyes? They say that the eyes are the windows to the soul and I agree. But I do believe that the eyes share the truth, they share stories, they share the hopes, the dreams, the disappointments, the sadness, the happiness... you can't hide the truth from your eyes. I looked and I saw a deep sadness. I saw an emptiness inside of me. I saw the woman I once was and here is her story. She was a woman who was sharp, witty, creative and idealistic. A woman who could fire a witty response faster than the victim would realize she had already struck them down with a barrage of comedy, candor and frankness. A woman who could rattle off a thousand creative ideas that would inspire a listener to run off with stories to write, crafts to make and businesses to build. She could write a story so vivid and full of emotion, that the reader would cry with her. That same woman believed in love. That same woman loved to wear makeup, fix her hair and dress up. Now, the idea of brushing her hair is exhausting. As a matter of fact, there is a tangle that she can't muster up enough energy to brush out, so she smooths her hair back into a bun to hide the chaos that not only resides in her hair but in her heart, her life, her home, her mind and her body. The chaos of mental illness consumes her and has darkened her view of the world. The same woman's mouth used to smile. Her smile would reach her eyes but now, her smile is barely an upturn at the corners of her mouth and her jaw is clenched tightly. She cared once upon a time about wanting to be pretty but none of it matters any longer. She just wants her mind back. She wants the focus, the clarity and the sharpness to return. She wants to be able to form sentences that are much more complex than the simplistic lines she creates these days. She feels her vocabulary is gone. She wants to rest. Her mind. Her body. Her soul. Each are intensely weakened. She is full of fears- fear of the mental illness consuming her so completely that she will never come back to the world of the mentally healthy. She is afraid to have testing done to confirm her doctor's suspicions that she may have multiple sclerosis. Her body which was once strong is now quite weak. Her hands go numb often, the fatigue threatens to steal every minute of the productive daylight hours from her and her neck and shoulders burn with pain. 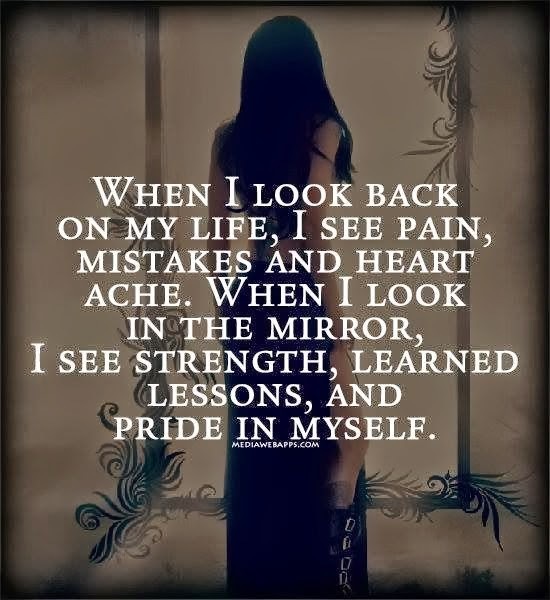 However- she sees her inner strength. She has overcome a great deal of adversity and won't stop fighting to win the race. She is also an extremely driven woman who will achieve every goal she seeks out. She dreams of succeeding in her life. She will achieve and win the war against the darkness of depression, post traumatic stress and anxiety. She will achieve the goals she has set forth. She has also accepted that it's okay to have to be on medications to get her mind healthy. The past has happened and has defined the future, like it or not but it's how the past is used to shape the future that is important. She is me. I am her. Together- my past, present and future self will team up together and fight the beast, win the war and live in peace. I have been at a crossroads. As you have seen, my blog has been on the back burner a bit as I work on focusing a million things with only having enough time for one thing. I am dealing with huge changes and I want to bring myself back to one of my loves- writing. I have been really working towards rebuilding my mental focus, my ability to recall and retain events/memories/stories/etc. (my mental recall has been abysmal), and work on storytelling and improving my writing. I am working out an editorial calendar and I will be testing the waters on when my personal musings will be posted. It's going to be trial and error. Oh yeah- The Hungry Introvert is live! Only one post but come and say hello! I am still working on the design but baby steps! #TRESemmeTransformation: From Nanny McPhee to Me! Do Numbers REALLY Matter For Bloggers?